When I took my first business trip as a Gnip team member more than 6 years ago, I accidentally brought home my hotel key in my back pocket. My kids were very young at the time & they thought the credit card sized piece of plastic was amazing. They were actually arguing over who got to play with it next. So, on my next trip, I brought home another key. After a month or so, the novelty wore off and the kids stopped playing with the keys, but I kept collecting them for some reason that I didn’t consciously understand at the time. This picture is of all the keys from all my business trips over the last 6+ years. Each one of these keys is one to seven nights away from my family. I don’t like to dwell on it, but I missed some important moments of my children’s young lives while I was away. There were more than a few trips where I left the house with one of my kids crying and begging me not to go. Countless calls home at night started with “Dad, when are coming home?” The most heartbreaking calls were when I would hear “Dad, I wish you could have been here to see (fill in the blank).”. I often got off the phone thinking I was living a sad and unavoidable Harry Chapin – “Cats in the Cradle” prophecy and it depressed me in ways that I can’t really put into words. I’ve had friends admit that they sometimes look forward to business trips because it gives them a break from their families and home life responsibilities for a few days. That thought has never crossed my mind. My usual travel routine was to compress each trip to as short a time as possible. I typically tried to depart late at night or early in the morning to minimize time away. I constantly tried to cram two days worth of meetings into one day so that I could get home as quickly as possible. This routine often resulted in me coming home completely depleted of energy and desperately needing sleep, but always happy to be home! When I reflect upon this visual tower of entrepreneurship, there were definitely some game-changing and a few life-changing wins that resulted from these trips. But, I don’t remember the wins nearly as much as I recall the setbacks. As one example, there was the time I had prepared for weeks for a big meeting in New York. The entire team knew this meeting was happening and was excited to hear the outcome. When I landed in LaGuardia, I had a voicemail waiting for me from my meeting contact: “Hey, sorry to have to miss you this trip but something has come up. Let’s get something scheduled early next year when things calm down over here.” Back on the plane I went wondering why I had allowed myself to lose an entire day of my life and weeks of prep for something that wasn’t going to happen. I also had the whole plane ride home to think about how I was going to break the news to the team. Unfortunately, these types of “setback” trips weren’t that rare. My best guess is that more than half of the trips that these hotel keys represent ended with an outcome that was not what I had hoped would be achieved on the trip. The goal of the original New York trip was eventually realized, but it took many more months and several more trips to NYC to make it a reality. One friend recently suggested that I should convert these keys into a piece of artwork for my office as a reminder of the journey. I’m not sure if I’ll ever do that, but if I do make it into art someday I will definitely call it “Two Steps Forward, One Step Back”. Running a startup is damn hard. Being physically away from my family was hard, but they might suggest that it was harder when I was physically present but I was mentally off thinking about some issue with the company. Your startup is often on your mind in some capacity every waking moment. Failing is hard, but I sometimes think succeeding is even harder because the expectations you put on yourself and the expectations of others (investors, employees, etc.) just go up with each success. I had an amazing run at Gnip and later at Twitter. But, it came with a lot of sacrifice and some permanent scars. I try to embrace the scars because I believe that I can continue to learn from them and (more importantly) I can help others learn from my experience. I’m two months into my new career as a partner at Foundry Group, and I’m loving every minute of it. My partners Brad, Jason, Lindel, Ryan, and Seth are incredible but I already knew that would be the case before I joined. I’ve been spending the bulk of my early days with our portfolio companies. I knew some of these teams already, but I’ve also been able to spend a ton of time with teams I didn’t know. These teams are building amazing products, but the thing that has struck me most is the quality of the teams themselves. Across the board I’ve found these entrepreneurs to be humble, smart, passionate and unwavering in their commitment to make their companies work. If there is one theme that stands out to me about our portfolio more than any other, it is that we’ve invested in really great people. I’m still adjusting to the fact that I’m now sitting on the other side of the entrepreneurship table. Telling someone I’m a venture capitalist doesn’t exactly roll off my tongue yet. That said, I know my most important asset as an investor is that I’ve been on the other side of the table and I understand that life on that side is nothing but endless challenges. My hope for my career as a VC is that I never lose the empathy I feel now for entrepreneurs. I have a strong visual reminder if I ever forget. Chris – love the post, insight and POV. We are all grateful to have you in this community and work with you! 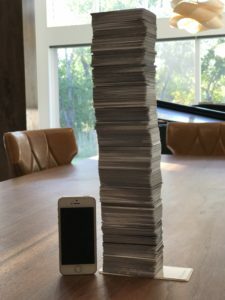 That tower of cards is incredible. Made me think about how I spend my time now that I have a family and two young boys. Thank you for sharing such a powerful (and haunting) visual. I had a visceral, physical reaction to seeing it. Thanks! I have the same reaction when I look at the cards. Thanks so much for your vulnerability and openness Chris. Inspiring and reassuring :). Glad to hear Foundry’s going well!! Loved this post, Chris. You should make the cards into art — or, at least, leave them in a pile on your desk forever. This life is exhausting; so, knowing that a prospective partner and board member “gets it” is really important. The cards are a small piece of evidence that you’ve been there. Thanks! I’m on the fence. Maybe it is too soon, but right now when I look at the cards it makes my stomach hurt. PTSD… hotel edition. I totally get it. Throw them in a drawer… I made a calendar event to remind you about it in six months. Chris, wow just don’t hear many VCs talk this way, great to see your portfolio company entrepreneurs will have someone who gets the push and pull. I didn’t glean from the post if you ultimately thought it was worth it? I think that is an important part, we all make trade-offs. Wil, great question. Yes*, it was worth it (note: the asterisks). By the way, my conclusion has virtually nothing to do with the fact that there was a good financial outcome for me and for the company/investors. It was worth it simply because I learned so much throughout the process and I made so many new lifelong friendships along the way. I’m incredibly proud that we were able to bring an important company like Twitter to my hometown of Boulder, CO. Finally, I’ll never have to look back and wonder if I could have done more to make the business successful. I gave it everything I had and that is a weirdly satisfying feeling. * I’m not big on regrets, but I’m obviously sad about all the important family events I missed. My family was incredibly supportive throughout the process. They were the first to cheer me up on the bad days and the first to celebrate the big wins. We’re all thankful we went through the process together.